In many instances, Boone Central/Newman Grove athletes saved their best for last – as it should be. The Cardinals concluded the 2015-16 school sports slate in the annual Nebraska State Track & Field Championships at Omaha Burke with dash and flair, earning the praise of Coach Kris Pestel. “Our kids had a great state meet! Their dedication to working hard and improving all season paid off this weekend,” Pestel commented. “We were able to bring home six medals, set five new school (Boone Central) records, and the girls were able to finish in the Class B top ten in scoring! Leading the way in outstanding performances, as has often been the case during her Cardinal career, was senior Sheldon Beierman. She was runner-up in the 100 meter high hurdles in a new Boone Central record time of 15.12, placed fourth in the 300 meter low hurdles (47.15), and added a fourth place medal in the high jump (5’2). Senior Ashlynn Baker also closed her high school career with her best. Baker earned fourth place medals in the 1600 meter (5:21.95) and 3200 meter (11:45.16) runs, breaking her own 1600 school record and lowering the 3200 Boone Central standard previously held by Ashlynn Bader. Senior Jared Zwiener placed eighth in the Class B pole vault, while boosting his Boone Central record in the event to 13’6. Senior Damian Backus did not earn a state medal in the 400 meter dash, but did break Danny Gray’s 2002 Boone Central record with a personal best time of 51.73. 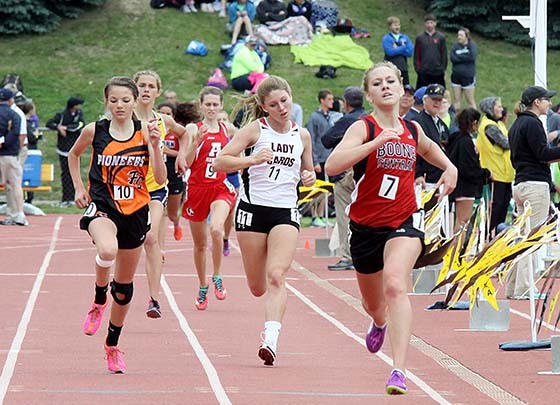 Although Riverside athletes competed in a number of events, many successfully, the Chargers had their eyes on one key prize entering the 2016 Nebraska State Track & Field Championships at Omaha. The 4×100 meter relay was their Holy Grail. After setting a new all-time Class D record in the event at the Central Nebraska Track Championships in Grand Island, the quartet of Kalie Bloom, Karen Schmeits, Molly Berger and Alix Bloom were set on state championship gold and, hopefully, another record time. The 4×100 event can be exhilirating and breathtaking. It is intricate and challenging. It can also be agonizing and heartbreaking. So, it was no surprise the Chargers entered Saturday’s big race with a few nerves. Especially after a botched handoff in practice earlier in the week. Riverside dashed to the coveted gold medal, completed an undefeated season in the event, and established a new state meet record with a time of 49.50. It didn’t quite match the blistering 49.12 G.I. clocking, but gives the Chargers the brace of state and state meet Class D standards. “I’m just extremely happy for those girls, who put in a lot of hard work and got what they deserved,” said Riverside Coach Jeff Schwartz. While not requiring the split-second precision of the 4×100, with four circuits of the track, four runners, one lap by each athlete, the 4×400 relay is one of the purer events in track and field. It was purely golden for the Spalding Academy Lady Shamrocks at the 2016 Nebraska State Track & Field Championships in Omaha. The Shamrock team of Beth Keber, Maddie Esch, Erin Stevens and Briana McKay capped Academy’s state meet weekend in the final event of the Saturday, defeating the Class D field in a personal and Albion News area best time of 4:09.12. Academy state success was all about team in 2016, as the Shamrock 4×800 relay quartet of Erin Bloom, Anna Esch, Beth Keber and Kaitlynn Carraher opened the competition Friday with a third place effort of 10:20.07. Spalding runners excelled in all three relay events at Omaha Burke, with the team of Kate Hartley, McKay, Keber and Stevens placing sixth in a time of 52.00. Maddie Esch added an individual medal for the Spalding Academy girls, who finished 11th in Class D with 20.5 points. Esch finished in a seventh place tie in the high jump, clearing 5’. Hard work and perseverance paid off for the St. Edward Beavers in the final event of the 2016 Nebraska State Track & Field Championships at Omaha Burke. After DQing in the 4×100 meter relay, the Beaver 4×400 quartet of Noah Micek, Jonah Micek, Brandon Miller and Brayden Olson secured medals with their final chance, placing seventh in Class D with an Albion News 2016 area best clocking of 3:35.22. That performance followed a superlative effort by Miller in the long jump, as he won the Class D silver medal with a leap of 20’6¼. The 2016 Nebraska State Track & Field Championships were no small leap for Tarrin Beller of Humphrey/Lindsay Holy Family. The Bulldog standout used big efforts in both jumps to claim gold and silver medals in the competition at Omaha Burke Stadium May 20-21. Beller won the Class C triple jump with an Albion News 2016 best of 36’4 and added a second place award in the long jump with a leap of 16’9¾. Taya Beller also brought home hardware from the state meet, placing eighth in the triple jump (34’3½).